Baked Spaghetti Squash makes the perfect side dish on its own or is great topped with Homemade Pasta Sauce or served alongside my favorite Chicken Parmesan Recipe! This easy veggie is much lower in carbs than pasta (of course) and has a light flavor with a shape that mimics spaghetti strands. This veggie isn’t exactly like eating a bowl of your favorite egg noodles, but it’s a pretty tasty substitute! While I love to Cook Spaghetti Squash In The Microwave, cooking it in the oven produces a different flavor. Baked spaghetti squash becomes slightly caramelized on the edges making it sweeter and a bit richer, more like a winter squash (although it’s still much less sweet than roasted acorn squash). It pairs well with robust pasta sauces, marinara sauce or even topped with crock pot meatballs. We also love to serve it as a side dish with butter, salt and pepper (and a sprinkle of feta or parmesan). 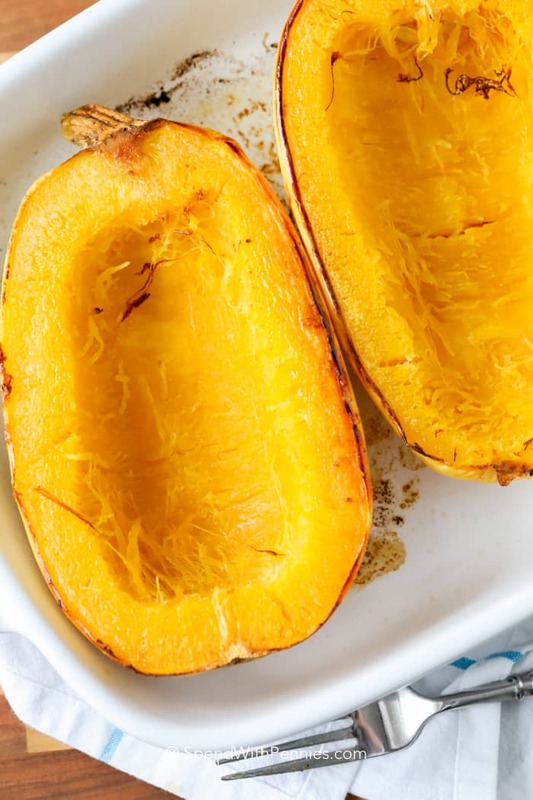 Just like Roasted Butternut Squash, spaghetti squash is easy to cook in the oven but not always easy to cut. When I buy spaghetti squash at the grocery store, I ask if the grocer can cut it in half for me and most of the time they will! If you’re cutting it yourself, microwaving it 3-4 minutes will make the outside of the spaghetti squash tender and much easier to cut. Be sure to poke the squash it with a fork a few times (and don’t cook it longer than 5 minutes, it can build up pressure and burst if it’s whole). I most often bake spaghetti squash at a higher temperature to allow it to caramelize. If you are cooking other items in the oven at a lower temperature, you can cook the squash with it and just add a little bit of extra time. The cook times can vary based on the size of your squash. You can tell if your squash is done if you can pierce through the skin fairly easily. You may want to check your squash 5 minutes before the cooking time in case yours is ready a little earlier. Some recipes ask for a bit of water to be added to the dish which may reduce cooking time slightly as it can help to steam the squash. I personally prefer it without as it gets a better caramelization and the strands hold their shape better. I’ve seen spaghetti squash as small as 3/4 lb and as large as 4-5lbs so of course the number of servings per squash will vary. A medium to small squash will serve 4 as a side dish and 2 as a main topped with sauce. A large squash will serve closer to 6 (or even 8) as a side dish and 4 as a main. Spaghetti squash both freezes well and reheats well (plus its great added to Homemade Chicken Noodle Soup) so I always err on the side of extra if I’m not sure about servings. 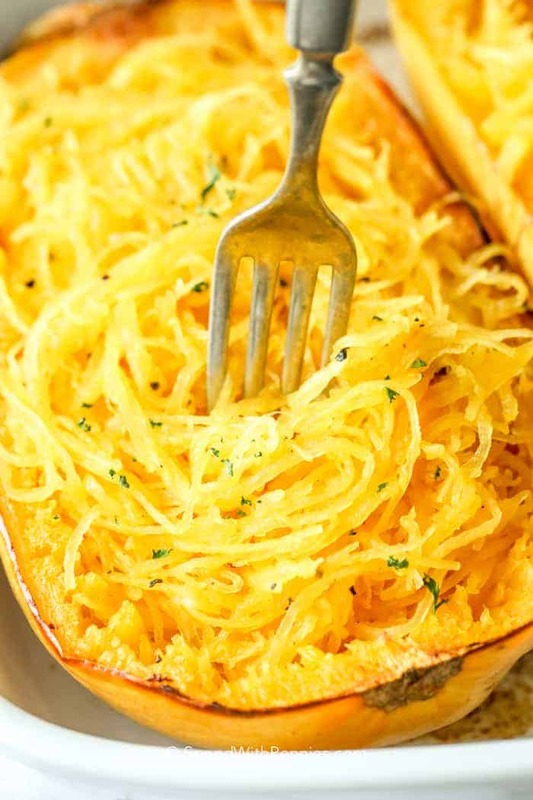 Baked spaghetti squash is easy to make and produces tender spaghetti-like strands. 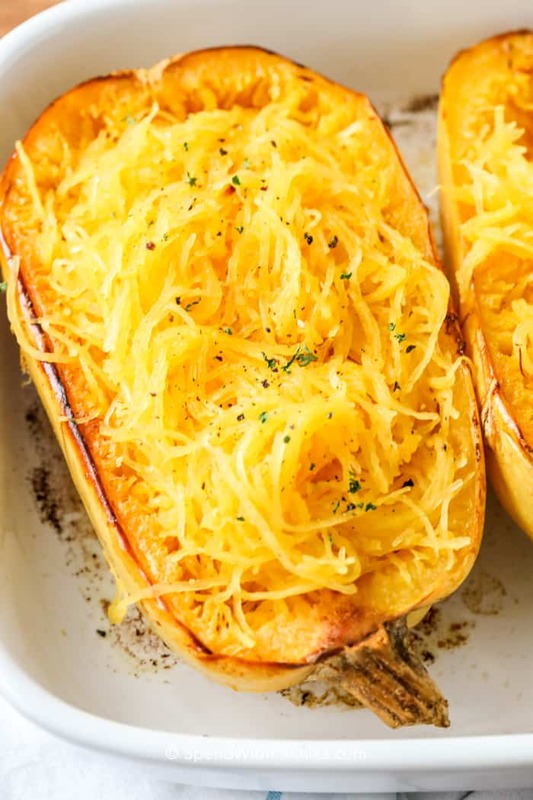 Cut spaghetti squash in half lengthwise. Scoop out seeds and stringy bits and discard (or save the seeds for roasting). Drizzle the cut side with oil or spread with butter. Season with salt and pepper. Place cut side down and bake 40 minutes or just until tender. Cool 5 minutes. 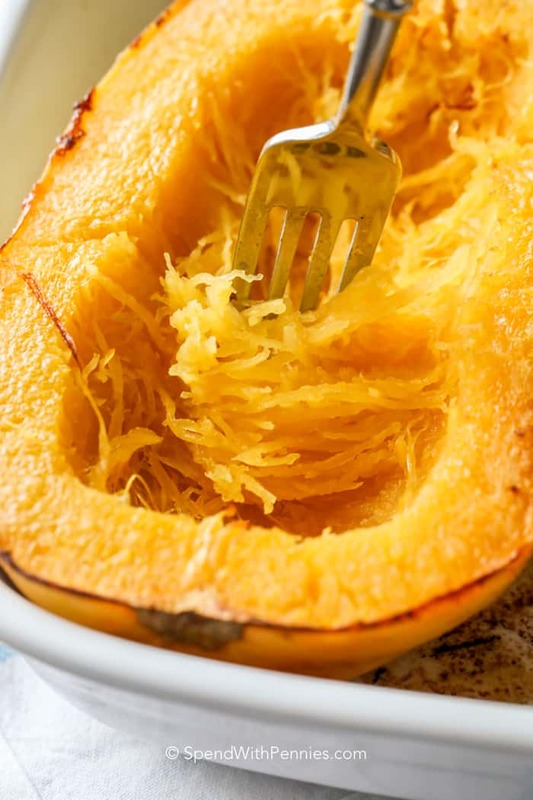 Flip spaghetti squash over and gently run a fork down the squash to separate into strands. Season with additional butter, salt and pepper if desired.